Projecting computer images has become an essential teaching tool. This section will help you learn how this takes place and how to make your laptop work with our projectors. Because there are literally thousands of laptop configurations, models, screen sizes and screen resolutions out there, we cannot know how each laptop works. Please understand that the information presented here is no substitute for reading your instruction manual, testing beforehand or a hands-on training. Spending 30 minutes testing the equipment BEFORE the semester starts can save you lost teaching time. Call us at 410-516-6699 for assistance. know your laptop's display requirements. know your laptop's resolution requirements. Know how to configure your ethernet adapter for the Internet. You attach a VGA cable FROM the projector or podium TO the laptop. 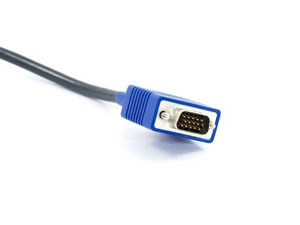 Important note: Some laptops like the Sony Vaio, the Apple iBook, Powerbook and MacBookPro do not have standard VGA monitor connectors. Make sure you have any adapters or docking ports with you or you will not be able to connect to our systems. It is not our policy to provide them. 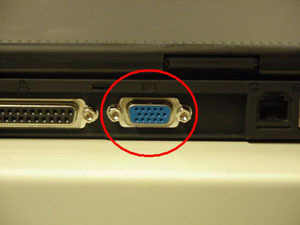 Please call 410-516-6699 for a consultation if your laptop does not have the standard VGA connection pictured below. As we are beginning to transition into fully digital systems (HDMI), you may begin to see different cable options available. Connect the VGA cable from the podium or projector to your laptop. Turn on the PROJECTOR, either by pressing the appropriate input on the touch panel, by pressing the ON button on the button panel, or if the projector was delivered, the POWER button, let it warm up and select the proper COMPUTER input using the MODE or INPUT button. This is important because when you turn on your computer, it looks to all the ports and connectors to see what's hooked up to it. So theoretically, the computer will know there is a projector connected and send the image that you see on the screen out to the projector. What do you do when it doesn't send the image to the projector? On your laptop's keyboard, find the key marked "FUNCTION" or "Fn" (lower left corner of the keyboard). Then, search for a key that has either the letters "LCD/CRT" or a little monitor icon. Most often, it will be in the top row of keys marked F1 through F12. When you have both keys located, press and hold the FUNCTION key and then press the LCD/CRT key that you located before. It might take a couple of seconds for the computer to react. So if you press the "Function" key sequence once, you'll get an image on the projector, but your laptop screen will go black. Press the key sequence again and you'll see the image through the projector and on your laptop. All Apple laptops made since 2008: Hold down the Command Key (to the left of the spacebar) and press F1. This will toggle the mirroring on and off. First time setup: System Preferences>Displays>Display Tab. Two windows will appear. Check that the resolution on both is 1024x768. Also check the "Show displays in Menu Bar" checkbox to put a display shortcut at the top of your screen (near the clock). Know your laptop! Read the manual and carry it with you. Always do a dry run before your class starts to work out any bugs. Screen resolution affects what you see projected and how it looks. This will be important if you use fine, detailed images and text. The back story: When desktop computers were first introduced, monitors and projectors had the same resolution: 640 pixels wide by 480 pixels high. Today, monitors and computers have advanced to the point where many different resolutions are possible up to 1920x1200 pixels. Most modern laptops use a 16:9 or 16:10 widescreen format. Most of our projectors use 1024x768 resolution and project a 4:3 format. In a nutshell: Our projectors display up to 1024x768 (higher resolutions will be compressed down to 1024x768). If your laptop has a widescreen display, the laptop screen and the projector image will not match. When you connect your laptop for the first time, go to the Displays Preferences and set your laptop and projector output to 1024x768. When you change the setting to 1024x768, the laptop screen may have black bars on the sides or be stretched. This is normal. 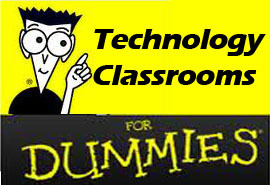 When you unplug from the projector, the laptop should return to normal. What happens when I use an external display with my MacBook Pro with Retina display? Your MacBook Pro with Retina display automatically optimizes the resolution for your internal Retina display and any external displays that are attached. You can adjust resolutions for displays by choosing System Preferences from the Apple menu and then clicking Displays. This allows you to optimize for the internal or external display, or even scale the content on both. If Mirror Displays is not enabled, then you are using Extended Desktop mode. In this case, resolutions can be set individually for each display. Check the Display System Preferences window that has the description for the display you want to adjust on the top of the window (there will be a unique preferences window for each display). Adjust as necessary. I need a resolution for my external display that is not appearing on the list. Is there a way to get more resolutions to appear? Yes. Hold the Option key down while clicking the Scaled button to see more resolutions. This is only available in extended desktop mode. How do you know what resolution you're using? OS X: System Preferences -> Displays. You will also need to bring a VGA adapter if you plan to use our projection systems. So what should you do? TEST it before you need it. Get into your classroom and try it before your first class. The HOPKINS wireless network is readily available in most technology classooms (signal strength may vary). An ethernet cable may be available in some rooms but it is not always guaranteed. To use either network, your laptop must be resigtered in JHARS. Also, we do not perform repairs on data connections and make no assurances that the port is active in each room. Please direct all repair questions concerning data jacks to x6-HELP (410-516-4357). There is no quick fix for ethernet problems. Download all pages or video files you need to your laptop, and copy them to a flash drive as a backup before class. The links will not be active, but you'll have the pages to view. Get your presentation off your laptop and on to another form of computer media. Purchase a Flash drive and copy your files on to it or burn it on to a CD. Always carry it with you. In the event your laptop fails or will not display properly, you can use the installed PC in the podium (where applicable) or borrow another laptop.